EP 10 - Driving business! Built on the core technologies of the Omnii™ platform, the Psion EP10™ packs full-sized functionality into a handy, ergonomic device - making it the industry’s most powerful, durable enterprise PDA. Unlike consumer-grade hardware, EP10 is optimized for commercial and industrial applications. 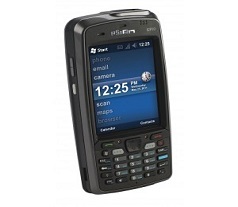 It delivers all the performance of Psion’s premium industrial handhelds – in a more affordable, compact form. The EP10 features industry-leading power. Built with the latest Texas Instruments AM3715 Sitara ARM microprocessor, the EP10 delivers benchmark performance with an 800 MHz clock speed and ultra-fast 1375 Drystone MIPS. Its superscalar architecture allows for more efficient computational logic, and its 256 RAM / 2 GB Flash memory provides better support when running multiple applications simultaneously. Size, form factor and ergonomics are all EP10 strengths. Weighing only 345g with a durable case, the EP10 is light and well-balanced in the hand and it’s just as easy to pocket as it is to use. It also features a backlit keypad that is designed for ambidextrous, one-handed operation. Although small, the EP10 is still big on features. Delivering full phone functionality, the EP10 comes with an integrated 3.2MP camera, onboard scanning which speeds up data collection with its 2D omni-directional imager, and both standard and high capacity Li-Ion rechargeable battery options providing power for an entire shift. Dedicated radio designs give EP10 total flexibility and quicker data transfer across all applications. The EP10 supports the latest mobile communication standards including CDMA (EV-DO rev A) or GSM (UMTS 3.8G HSPA+), GPS, WiFi and Bluetooth®. The EP10 boasts a large, high-resolution 3.7” VGA color transflective display as well as an integrated touch-screen that can be operated by finger or passive stylus. The display has been designed to be sunlight readable by day and backlit for darker conditions. EP10’s in-built interactive sensors enable mobile employees to work smarter with its context-aware computing. It is packed with everything from proximity and light sensors to an accelerometer, gyroscope, digital compass and GPS, allowing for automatic backlighting and screen rotation and accurate data geo-tagging capabilities.